I'm converting my program to a webpage! Using Python + Django. Since I'm a Network Admin, I know keeping programs up to date can be annoying. A Web app on the other hand, can be updated once and its everywhere! Not to mention the compatibility of just needing a new'ish web browswer to run the thing. Well, here it is after about 4 days, learning what I needed, how to use what I needed and actually making the program. Here's a screen shot. 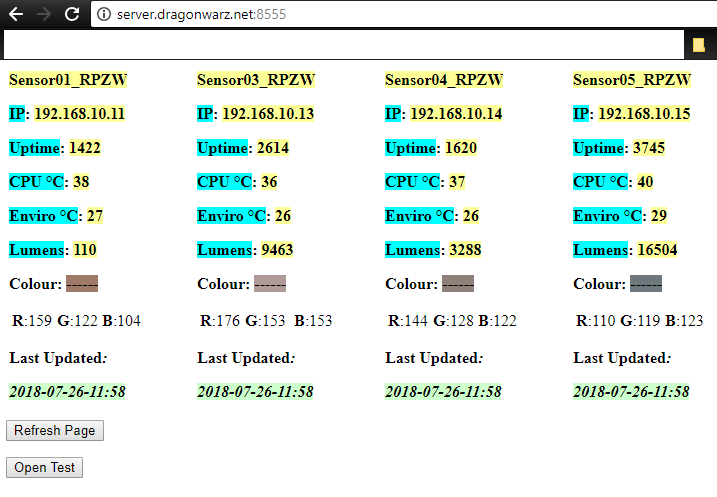 I have it displaying multiple sensors, which the readings get updated every time you goto the page. Most of it is self explainitory, although the funny dashes and colour after "Colour: ", is the actual colour representation of the RGB light sensor. Now I have to bring over the other stuff like updating sensors, rebooting devices and downloading the longer term sensor logs.